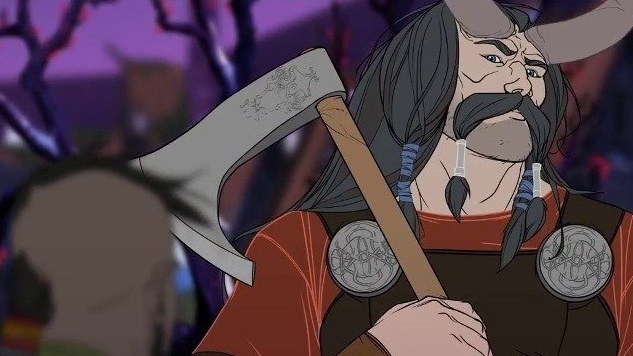 The Banner Saga games have always been about the way people approach the end of the world. It’s a sobering moment for an entire universe, knowing that—barring some unforeseen massive upheaval—everything and anything that constitutes the known reality will be gone. Not “gone” as in physically gone, but “gone” as in irrevocably changed. In the world of The Banner Saga the end of the world is a point of no return on the horizon, invading faster every day. The Banner Saga physicalizes the end, a creeping alien darkness spreading over the land, leaving twisted remnants of whatever was before in its wake. Apocalypticism can be romantic. It’s the same dark romance that lures people toward stories of destruction, train-wrecks, widespread calamity and other disasters. Apocalyptic stories offer, above all else, a changing-point, a time where what is becomes what was, and what was is changed beyond retrieval. The apocalypse becomes a flashpoint between two wildly different eras. The Banner Saga isn’t set quite there, yet. The games all focus on the moments before and during the end, where the people who inhabit the land know the land is dying. This complicates the binary idea of pre-apocalypse and post-apocalypse: the game explores both areas already touched by the darkness, and those that are holding out. In many ways, it is a game set within an apocalypse. It’s a precarious position above all—while everyone is in agreement that the world will not ever be what it once was, no one quite knows the best way forward. It is, then, an extremely familiar-feeling game. Outside of the game, in our world, global warming is approaching catastrophic levels. The sea is warming, the ice caps slowly melting into the ocean. Political leaders bicker over how much to cut taxes as our children starve and struggle in overcrowded classrooms. Progressive social movements are met with dismissal from the representatives meant to champion them at the federal level. The various social nets that once felt robust in American society now feel brittle, fragile under the weight they are forced to carry without adequate support. In other words, it feels like the world is ending. Or, at the very least, we are at the precipice of some other world breaking through—a world that could reveal itself as a twisted, cruel shadow of the one we grew up in, or one that is shaped by the most fearless of us still willing to work toward the good. One of the storylines in The Banner Saga 3 concerns the last bastion of civilization, the city Arberrang, set along the coastline, just out of reach of the expanding darkness. It’s a complex, intermingled city of many different social and political forces, ruled by an aging king working against the landed nobility to provide for the city’s explosive growth in refugee population. The player, taking on the role of either daughter Alette, or father Rook, is tasked with helping the last survivors of the world make peace with one another. The last city in the world, as it turns out, is not exactly the most cooperative place on the map. Old tensions run hot, kings and rebels are forced to share close quarters, and former enemy combatants are everywhere. It is a powder keg of a city. This too feels familiar. What the player is tasked with doing here is less the actions of a war general and more of an activist, trying to rally together whoever is willing to hold the line against the end of the world. To the player, it feels absurd that anyone would not want to cooperate, but to everyone else, the idea is not quite solid yet. The majority of people in Arberrang are not warriors. They’re citizens, terrified and confused, forced into a place they’ve never known in a desperate hope to avoid the advance of an unstoppable force. They are unused to being pressed into action. It’s a familiar struggle to any organizer to try and rally people who are just as concerned about whether or not they will have food to eat tomorrow as they are about the possible end of the world. It is, put simply, hard to convince desperate people of a complex goal—not because they are not able to conceive of a complex goal intellectually, but because it is hard to focus on a grand injustice when so many smaller, minor injustices are more pressing, more proximate, and more capable of being bandaged. There is a conversation between the player (I chose to play as Alette) and your clan’s champion archer Oddleif, after a particularly frustrating argument between two powerful factions in the city. “Don’t you ever get tired of doing the right thing?” She asks. “What else can we do?” Alette answered. It’s that philosophy that underpins The Banner Saga 3. The world may be ending, but that doesn’t mean that the good we are doing doesn’t mean anything. The game manages to capture that feeling, in the Arberrang sections, of the overwork and undercompensation of activism, rallying citizens and doing the slow emotional work of bringing people together for a common cause.